Yes, you read it right, I didn't get the words mixed up. In his seminal book 'Understanding Media', Marshall McLuhan famously wrote in the late 1960's that 'the medium is the message'. But in the intervening half a century, the digital revolution has given us so much personal broadcasting power that the act of communicating (and how we go about it) is almost as important as the actual content of our instant emails, video uploads, texts, podcasts, twitters and blogs. All of which means that designers, more than ever, are visual psychologists. These days the design concepts of functionality, materials and content are just about obsolete. Apparently, its about convergence, fusion, harmony and light. Just ask Elliot Park, Principal Designer at Samsung, the world's most successful electronics (and hence gadget-producing) company. Park appeared on a BBC4 programme last week called 'Upgrade Me'. The programme is part of Electric Revolution - a BBC Four season charting the rise of today's globally-linked, instantly-gratified digital culture. It was presented by writer and poet Simon Armitage, who examined our obsession with gadgets, and explored why the newest upgrade is so crucial to our enjoyment of technology. He admitted he couldn't live without his iPhone, but at least he could remember the days when turning up on your bike at your local record shop to get the latest 7" single by your favourite band was the highlight of your week. There were some great moments - a class of secondary school pupils attempting to play a Madonna LP on Armitage's 1970's childhood Dansette, a giant flat TV screen which displays a Google Earth feed showing where the members of your family are at any instant, and the aformentioned Samsung's new Pebble-shaped MP3 player (see below)that looks like you've just picked it up from some rolling shoreline on a sunday stroll. But the crux of Armitage's investigation came when he met Park in Seoul, at Samsung's Headquarters (which ironically enough looks like some huge physical tribute to glory days of the Bauhaus movement). We got a glimpse of a design meeting about the new Jet range of mobile phones. It reminded me of my days in the games industry, working on titles for EA and Sony. The designers were sitting around a table, with ridiculous hats on, in goatee beards, chewing forever-lasting gum and drinking lukewarm Grande Lattes. And behind them on a flipchart was their enigmatic mindmap, with buzzwords like confidence, hybrid & fusion, harmony & contrast, light as material. It all gelled with Park's proclamation that what you feel about the product is more important that what you see, or what it actually does. 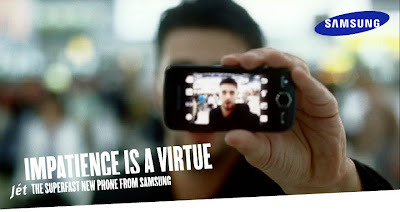 And the high-profile advertising that supports the jet phone is equally revealing - the 'Impatience is a Virtue' campaign. And so we come back to Marshall McLuhan. What your communication device feels like to you, and what it looks like to others who watch you doing whatever it is you do on your device, is more important than what you are actually saying. The message is the medium. Design exploits our vanity. Design is about capturing emotion. Long live design.